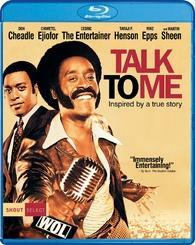 Don Cheadle (Boogie Nights, Hotel Rwanda) portrays the one and only Ralph Waldo "Petey" Greene in this immensely entertaining and inspiring true story. Ex-convict Greene talks his way into an on-air radio gig with program director Dewey Hughes (Chiwetel Ejiofor, 12 Years A Slave, Doctor Strange), and his unprecedented "tell it like it is" style breaks all the rules while electrifying a city and bringing a nation together when it needs it the most. Also starring Cedric the Entertainer (Barbershop), Taraji P. Henson (Hidden Figures), Mike Epps (Dolemite Is My Name), and Martin Sheen (The West Wing), Talk To Me tells the extraordinary story of an outrageous and beloved voice ready to shake up the world.